Discussion in 'Online Games - News and Reviews' started by Kotsy, Apr 7, 2014. Every now and then, a new online slot is released and I always wonder to myself as to why do they keep releasing basic video slots without any hoopla to them? Random Runner™ 15 actually took me by surprise. It is a true and tested video slot from Errel JVH Gaming (Novomatic Group) with the same old fruits and 7's. Saying to myself, "oh ya, this one is going be a stinka". Wow, was I wrong! In tradition with Novomatic video slots, you have your typical fruit symbols along with a 7.
actual playing. The look of the Video Slot is also not so typical. The payline are drawn out throughout the slot and gives it a really nice eye appeal. 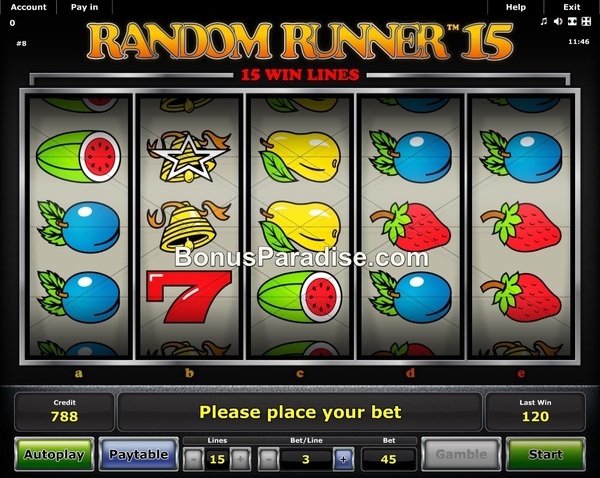 Random Runner 15 is a 15 payline video slot with 2 rows and 5 reels. The game interface is easy to navigate. you may elect to take your winnings or hit the Gamble button to double your win. Should you lose on the Gamble button, all winnings from that spin are forfeited. Winning combinations can pay in any direction as long as three same symbols appear adjacent to each other. Now that's a nice twist to this video slot. You can win left to right, right to left and even three in the middle. Another nice addition to this game is the symbols that appear with a "star" over them. Three consecutive like symbols will bring you the highest payout with the "star" on them. Winning symbols include, Star symbols, Seven, Bell, Watermelon, Grapes, Pear, Strawberry and Plum. Enjoy playing Random Runner 15 at Stargames. At first glance you'll think it's your typical, classic video slot. But this one surely has an edge to it and you'll love playing it. The Random Runner is a very favorite Video Slot in the Netherlands. The Random Runner is already 25 years old. I really looking forward to play this one. How cool!!!!! Thank you for the review Kotsy! Random Runner™15 is now available to play for real money or stars (just for fun) at Stargames Casino!